One of our most popular mountain bike skills courses if you are new to mountain biking, or a little more experienced but never been taught the MTB fundamentals of riding off-road. Our Core Skills mountain bike course will teach you the basic MTB bike skills to get out on the trails tackling technical terrain with confidence and commitment. We have our very own coaching trail here in the Lake District where you can learn away from the actual trails, allowing for a great learning environment. Following training you will see an immediate improvement in your riding and experience a boost in confidence. 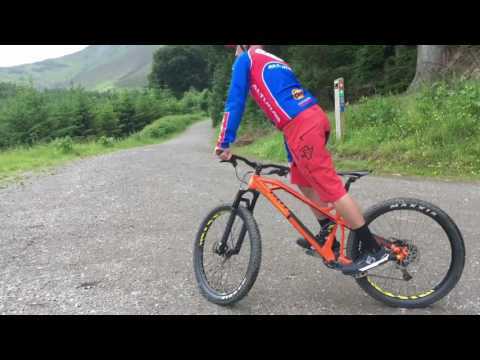 You'll understand how changes in your body position, footwork and where you are looking, can affect the way your bike behaves on the trails. You will also leave with the ability to tackle steeper terrain, corner with greater control and negotiate small trail obstacles with ease. As well as teaching the core skills, we will give you a thorough breakdown and understanding of climbing, descending and braking. Please can you pass on my sincere thanks to Nick Watson for a fantastic day of coaching. I’ve been mountain biking for about 10 years but found the course extremely useful in improving technical skills as well as general advise about bike setup and handling. Nick’s style and approach was absolutely spot on and it is clear that he has a true passion for Mountain Biking. Overall it was a thoroughly enjoyable day. Nick is a real credit to your business. Excellent Day, with lots of laughter and fun. I can't wait for the next course. I have had a fabulous day, the course was exactly what I needed. I now feel so much more confident to tackle things I would usually avoid. Cheers Ed, you were so patient and made the day so enjoyable. Instructor was excellent - all set up at the right level, great explanations and demos. Had a great time. Ed has been a really great instructor. Personable, knowledgeable & thorough. Thank you for a great day. 4 places available on this course. 5 places available on this course.